I will be the first to admit I don’t have a broad tea knowledge. We weren’t tea drinkers growing up, and coffee quickly became my caffeinated drink of choice in University. But recently I’ve started branching out into the world of tea. And let me tell you, there are a TON of different teas, and companies that offer them. When Adagio Teas approached me to do a review I initially wanted to decline. I thought I would feel like a fraud, trying various teas when I really only drink tea because someone else is making it. But I decided to give it a go, and perhaps learn a little something about teas in the meantime. And boy, am I glad I did! The first thing I learned was how to make an unboxing video. Watch my first attempt at a YouTube video through to the end – and let me know what you think! It was a lot of fun doing the unboxing. I’ve done another with the girls since then, so visit my YT page to check that out! Adagio Teas strives to provide high quality teas. They have a roots campaign – it’s a way to get to know the farmers and the products to foster understanding of the difficult conditions tea growers can face. Be sure to read to more about their roots campaign here. This is one of Adagio Tea’s top sellers. This is a really delicious black tea. I made a minor error in steeping my first mug of this flavour. The tea comes in small balls, but the directions say 1 heaping tsp. I used 4 of the small balls and I thought they would open in a neat way like the flowering teas I’ve seen before. The balls did open, but they just unformed from the ball shape and became loose tea. Which is great, except I just put the balls loose in my mug. I had to get a slotted spoon to scoop out the tea so it didn’t get to that bitter, oversteeped flavour! Despite leaves staying in my mug, the tea never got the bitter taste I associate with oversteeping. I think that right there is a testament to the quality of this tea. I added a small dose of honey to the first mug of this tea. It doesn’t need sweetening, but because I didn’t get all the leaves out, it did keep steeping a smidge more than I like. For me this would be 2 or 3 balls steeped for 3 to 4 minutes (the bag says 1 heaping tsp. for 3 to 5 mins.) and then drink clear and unsweetened. 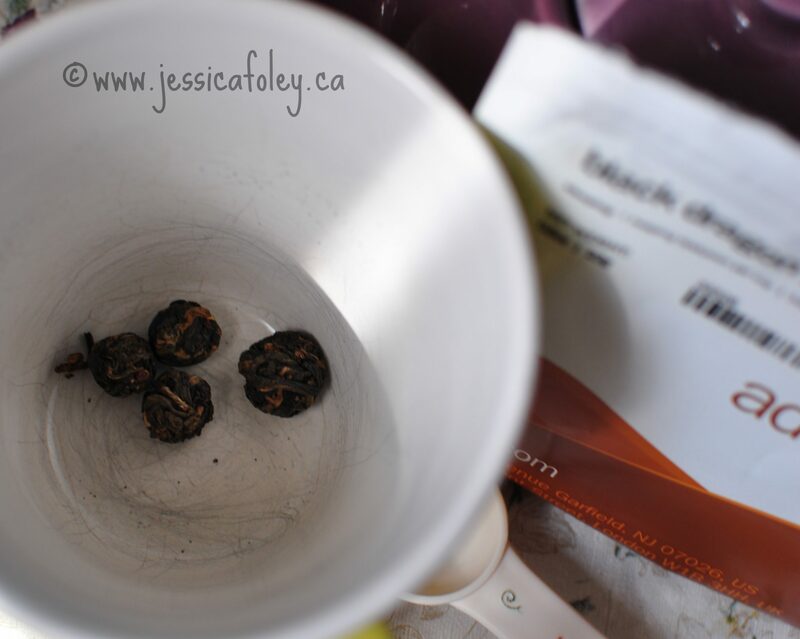 I predict my hubby would doctor it up the same way he does orange pekoe – it’s quite a similar flavour. My kids won’t try it because it looks and smells like “regular tea!” so they’re not interested. This pretty little tin was a bonus after I placed my order. 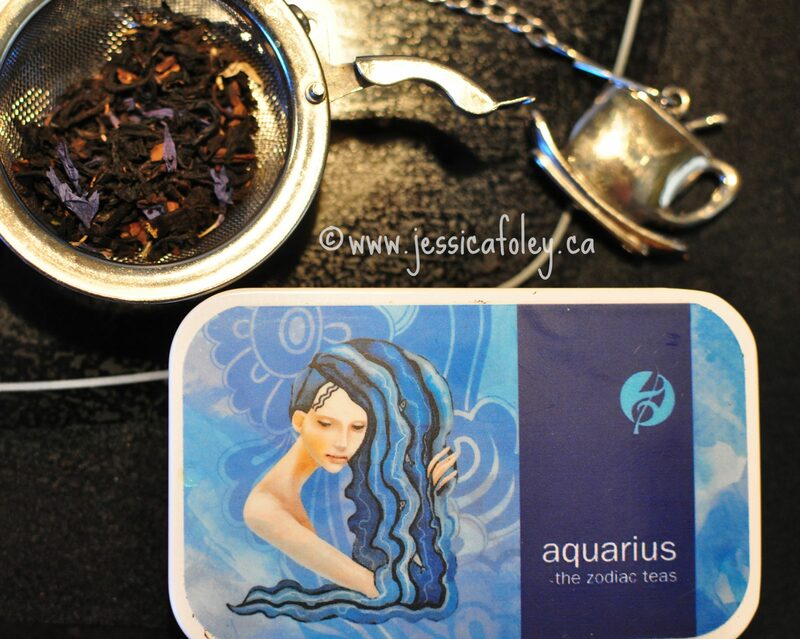 Because I shared about my purchase on social media (and because I’m born in February) they added a zodiac tea and tin sampler. I was a bit hesitant to try this flavour because I’m not a hazelnut lover. Turns out the flavours are really well balanced in this tea. The hazelnut is in there, but there are a lot of other flavours too – vanilla, cocoa, and a few black teas. It’s actually quite delicious! I chose this tea with the girls in mind. It doesn’t have any actual “tea” in it – it’s all herbal petals and fruits. For that reason it’s not my favourite of all the teas I chose. I like chamomile as it’s own tea, but somehow, for me, it’s not so great in a blend. Might be just my palette, but I find chamomile is a strong flavour that overpowers some of the subtleties in this type of blend. This tea is very light, so steep it slightly longer. I find this is good advice for most teas that don’t have “tea” in them. The fruits and such need a little extra time to extract the right amount of flavour. This tea suggests a bedtime vibe to me: no caffeine and some relaxing flavours – like the chamomile – give this tea a relaxing edge. I like a properly balanced chai tea. The spice is amazing, but I usually only brew a small cup for myself. It took me a long time to appreciate the strong flavours of chai. Now I know that while I love the first few sips, I don’t like a large volume of this type of tea. The addition of chocolate to a chai base is actually amazing. The smell is beautiful and the taste is great too. Emma was all excited to try this tea with me until she actually smelled it. She is a very picky eater (though recently is branching out a bit) so the strong smell turned her off immediately. She does love spices like cinnamon, but I think I have a few months (if not years) before she’s ready to try these strongly flavoured chai teas! 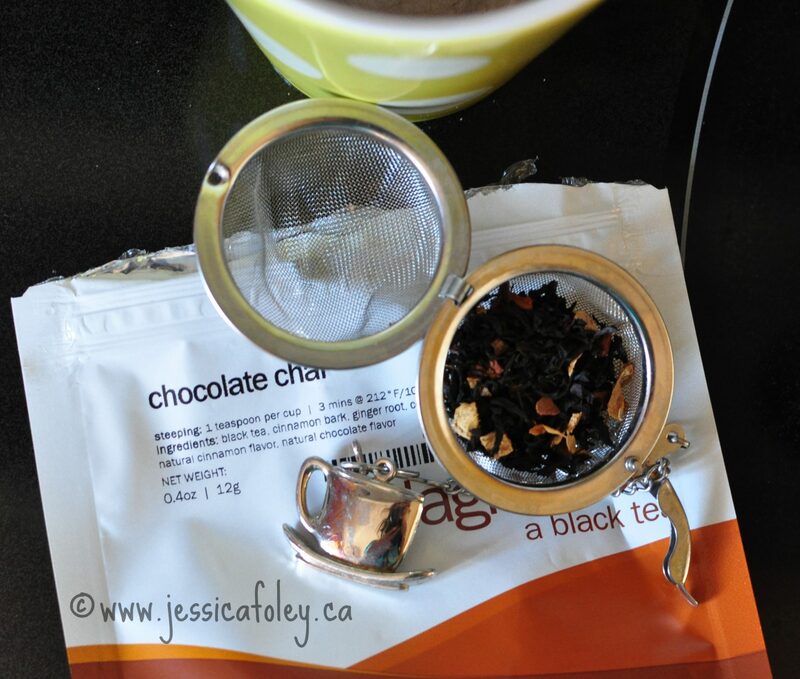 If you enjoy chai teas you will really like this one. All the classic chai taste is there, with some cocoa notes well. It’s a beautiful balance. 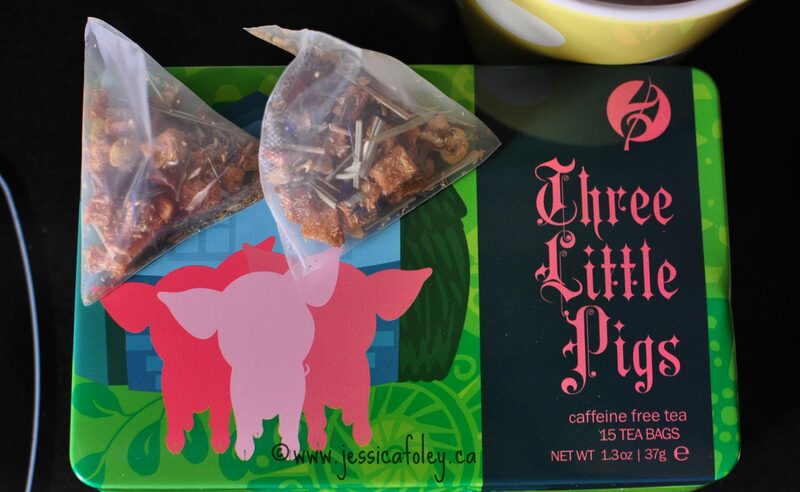 I chose this tea because of my youngest daughter: Rose. I will admit I didn’t really read the description until I went to brew the tea at home. It’s black tea with rose petals and rose flavour. When I opened the bag I will say I was slightly turned off. The smell of roses was almost overpowering. I’m not one to enjoy overly flowery foods and drink. But I went ahead and brewed a cup (with a non-heaping teaspoon) and gave it a go. Guess what? It’s good. The rose flavour is there, but not at all overpowering. The black tea is smooth just like all the others and rose is mostly in the finish and the aroma (or should I say bouquet?) I will brew this one again as well! Final notes on my experience with Adagio Teas. I was pleasantly surprised that I enjoyed all the teas that were shipped to me. Of course, I chose items that I thought I would like, but as I’m not very schooled in teas I’m often unsure what I like in certain blends. None of the teas got that bitter, oversteeped taste – even when I accidentally oversteeped them. (See the black dragon pearls, above!) And the few I made and then allowed to get quite cool (mom life!) still tasted just as good as when hot. What I really enjoyed about this company was their commitment to the farmers and growers, as well their extremely accurate descriptions of the teas. None of the teas tasted differently than what I expected based on the descriptions. That can be a challenge sometimes, especially when ordering online without a sales person to ask questions of. Adagio Teas has a great team behind them. If you know me personally, and would like to “have tea” with me I’m happy to brew a pot of any of these for a relaxing visit! Shoot me a message and we’ll have a tea party! Do you have a favourite flavour or blend of teas? I’m always looking for my next favourite! From this collection I like the Black Dragon Pearls for a really authentic black tea experience, and the Aquarius for something more relaxing. If you enjoy my reviews and have a product my audience will enjoy, visit my Work With Me page or contact me for more information on having me create a review or feature post for you. I am also available for social media promotion. Adagio Teas is my favorite. I am a tea drinker. I usually drink 5-6 cups of tea per day (without sugar, of course!) Glad to read this awesome review. 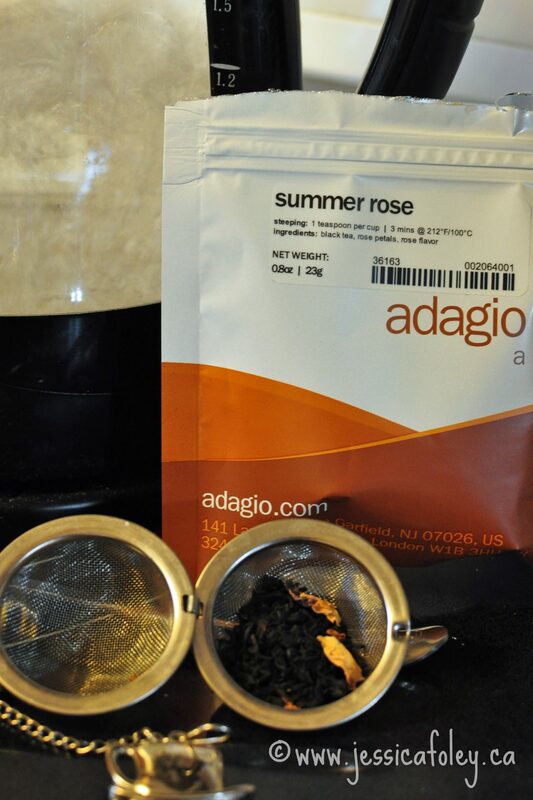 Glad to hear you enjoy Adagio Teas as well. They seem like a great company, and the tea is so delicious! What a great selection of tea Jess! And you know how much us Brits love a good old cup of tea! Although I’m not such a fan of flavoured teas myself. A nice breakfast tea with milk and no sugar is how I roll. It was so nice to have so many teas to choose from. Sometimes I also put milk and sugar in my breakfast/black tea – so delicious! Hi Jess, I grew up drinking tea and only turned to coffee after I had children (they drove me to coffee!). I enjoy a nice strong cup of black tea with a sprinkling of sugar. I have tried other teas, but never get the same satisfaction when I drink them… I love chocolate and spices, but the Chia chocolate tea sounds a little too much. I find tea enjoyment can be influenced by mood. Not sure how exactly, but some days I like flavour a) but then 2 days later I really don’t care for it. Black tea, though, goes great all the time! I like to drink the Black Dragon Pearls which has natural and fresh, sweet and rich aftertaste. Yes, I agree – it’s a very nice tea.